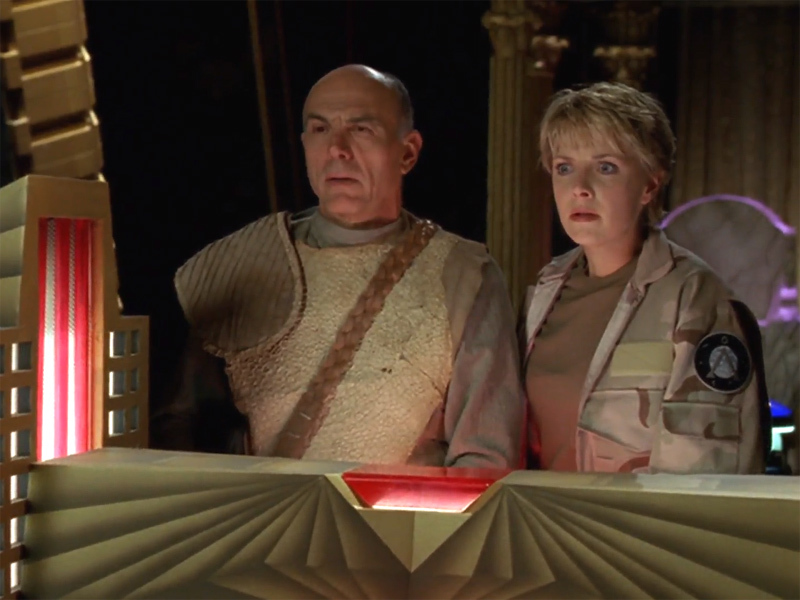 Before he was Jacob Carter, Carmen Argenziano played Urza Jaddo on Babylon 5. 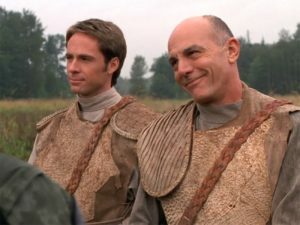 Carmen was among Stargate SG-1‘s best-known (and most loved) recurring guest stars, with some 25 appearances under his belt. 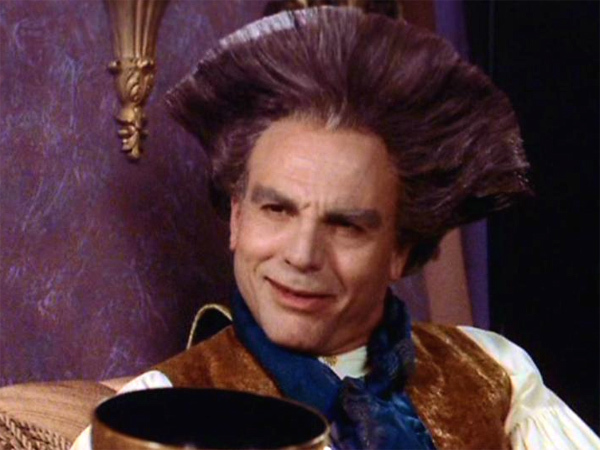 He made his debut as Sam’s dad Jacob Carter in the second season episode “Secrets,” and in subsequent episodes the character was blended with the Tok’ra symbiote Selmak. The experience saved Jacob’s life from terminal cancer, and made him an important liaison between Earth and its new allies. 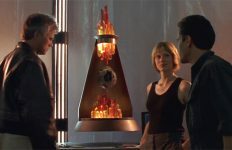 The show’s writers did in fact consider killing off the character in Season Two, but changed directions to make him a Tok’ra — and one of the show’s longest-running recurring roles. 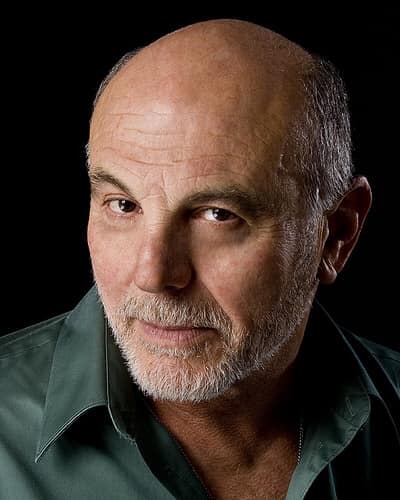 Carmen Argenziano has a number of still unreleased projects, according to his IMDb page. Among them is the indie film Preacher Six, in which he plays Father Gabriel. The movie filmed late last year. 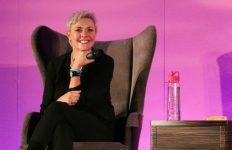 GateWorld had the joy of interviewing Carmen face-to-face on two occasions: once in 2006 (“The Journeyman”) and again in 2007 (“Father Figure,” available in audio). Carmen was warm and personable, down to Earth, and even in the midst of the bustle of a fan convention he was always ready to stop and give fans a good memory — a picture, an autograph, or just a moment of his time. Do you have a personal memory of Carmen you would like to share? We invite you to post below, or over on this thread at GateWorld Forum! This is very sad to read. 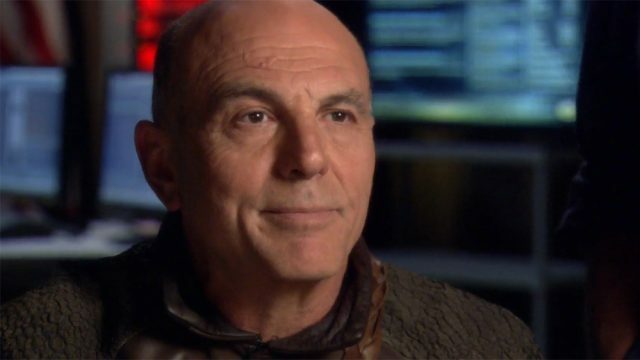 RIP Carmen Argenziano. He added something special to SG1 that I’ll always remember and continue to enjoy. Very sad. I’m on s7 in my marathon SG-1 viewing, and really enjoy his character. I can’t believe it! He will be missed. Loved Jacob Cater. Loved him on the show he will be missed. Prayers to his family and friends. God Bless AMEN!!!! 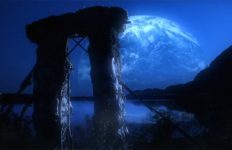 Dang, have just been doing yet another Stargate SG-1 marathon lately, introducing a friend to the show. This is gonna make the episode with the death of his character an even bigger punch in the gut when we get there. A class act all the way. 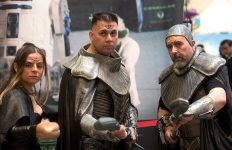 An actor that added just the right seasoning to help stargate SG1 become in my opinion one of the greatest sci fi adventures in television history, he will be missedby his many fans im sure. Very sad. He seemed so sincere in interviews, and though we know his character as Jacob well, he was a man with a life and a family most of us will never know, but we will honor his memory and never forget him. I was in fourth year medical school when they decided to scratch the world. I just feel that… his symbiote will turn out to have saved him. his symbiote Selmak was already very old when Jacob blended with him, I think by the time they both died in “Threads”, Selmak was already close to 2000 years old (at least that’s what I read), so it’s understandable that the symbiote was dying of old age, nothing can live forever. and Yu, who lived alot longer but only because of the sarcophagus, was suffering from dementia/alzheimers, became much more human tolerant at the end. Linda is right. Nothing lives forever except a truly exceptional few characters and people who have a significant impact on peoples lives. Carmen is from Sharpsville PA but the hospital he was born in was located in Sharon which is 2 minutes away because Sharpsville doesn’t have a hospital. Carmen was best friends with my uncle from high school until my uncle died in October out in California where he lived. Carmen even visited us at my parents with my uncle a few years back. Carmen is a great guy and lived only a few houses down from my parents growing up. Hope this helps you out with where Carmen was born and where he grew up. Thank you for the clarification on that, @Hometown! Glad you stopped by and posted about your family experience with Carmen. RIP Carmen. Stargate was blessed to have you be part of the team. I loved watching you play the part of Amanda Taping’s father and later as the host of the Tok’ra Selmac. I always looked forward ti the episodes you were a part of. From a long time Stargate fan, you will be missed. this is really sad, Jacob/Selmak is 1 of my fav characters in SG-1, RIP. I just found out about Carmen’s death. This is so very, very sad.